This is a brief story about the life of Eleanor Thornton. What little I know about her was gleaned from the probate records of her father, William, her mother Eleanor and her own probate. Life in the 19th century was difficult at best. Eleanor's life seems to have been one trial after another, up to and including her death. I hope there was some balance in her life and that there were some good times. Here is what I know about Eleanor Thornton. Eleanor Thornton was born in Thornton, New Hampshire. She was named for her mother, Eleanor, whose maiden name is unknown. He father was William Thornton, who was born in County Tyrone, Ireland in 1713. He had come with his family to New England in about 1720. He had married and raised a family with his first wife Dorcas Little, who died in 1763 in Schenectady, NY. Just before the start of the American Revolution, William returned to New Hampshire with a new wife and second family and settled in the new town of Thornton, which was named for his brother, Matthew Thornton. William was probably in his 50's when he remarried and when he died on 27 November 1790 he was 77 years old. He left a pregnant wife with small children. His daughter Eleanor, whose birth was not recorded was at least eight years old. Her older siblings also living in Thornton were; her half brother William, her brother Samuel, and sister Dorcas. She had two younger sisters, Sarah and Catherine and one younger brother Abraham. It is possible that her mother was born in New York and so had no close relatives in New Hampshire to help her. Eleanor struggled to keep things going, but by 1797 she threw in the proverbial towel. She petitioned the probate court to appoint another administrator to her deceased husband's estate. She could not pay off William's debts. 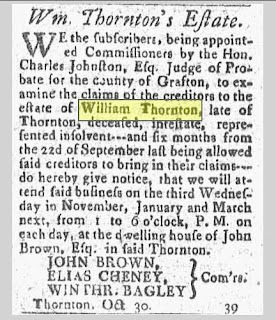 In 1797 the Judge of the Probate Court appointed Mr. John Brown to be, not only administrator of the estate, but also guardian of Eleanor and her younger siblings. The children would most likely have been taken from their mother's home and placed either with John Brown or with another family to be raised. Eleanor was at least fourteen years old at that time. I imagine she would have been put to work in the home of a local family. 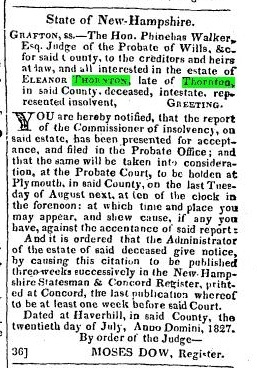 The struggling widow, Eleanor Thornton, remarried in 1798, her husband was Benjamin Avery of Thornton. She had been living on her deceased husband's farm for the eight years since his death, presumably with all her children. In the new accounting of William's estate she was required to pay rent for those eight years. A stark reminder that women had little rights in those days and they could not inherit their husbands land. The new administrator sent notices to all the local towns calling in anyone who was owed money from the estate. He also advertised the sale of the William's farm. The widow would keep her dower right to 1/3 of the land, but the rest was sold. Eleanor Thornton Avery's oldest children, Samuel and Dorcas, were both married by 1802. Samuel married Katherine Baker of Campton and after a few years left New Hampshire for Canada. He eventually settled in Wheelock, Vermont. Dorcas married John Durgin of Sanbornton, in Sanbornton. After the birth of their first child they moved to Campton, very near to Thornton. Sanbornton is some twenty eight miles from Campton. What was Dorcas doing there? Was she sent there for work? It seems likely to me that that was the case. In 1818, John Durgin returned to Sanbornton to collect Eleanor and all her belongings and bring her back to Campton. So it would seem that the two sisters went together to Sanbornton. Eleanor's sister Catherine, never married. In the 1830 census she lived alone in Campton. She would eventually end up living, first with John and Dorcas, and later with her nephew. In the 1860 census she was called a pauper. If their sister Sarah, married there is no record of it, and if she did her married name is unknown, making her impossible to trace. There is also no evidence for what became of their brother Abraham or the child that Eleanor, her mother, was carrying when her father died. Their mother, Eleanor, did not choose wisely when she remarried. Her new husband was or later became a bit of a bum. The town fathers, fearing the town would become responsible for the care of Eleanor and Benjamin went to the probate court seeking guardianship over Benjamin and his estate. They described him as being idle and inattentive to his business and placing his family in a precarious situation. 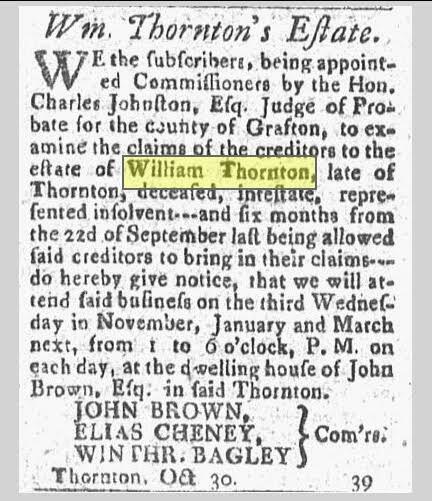 Benjamin did not object to the actions taken by the town, and agreed to allowing William Thornton, step grandson of Eleanor, to administer what was left of his estate. Benjamin and Eleanor's belongings were duly inventoried. The lived in a small house on about 25 acres. They owned a table and five chairs, one feather bed, some old tubs, cooking utensils, a spinning wheel, one cow, one calf and one pig. The total value was about $360.00. Not much. The records don't tell us what happened to Benjamin, he died by 1835 and Eleanor lived until 1845. She must have been quite elderly at her death. After her demise, her dower was sold to pay off the remainder of William's debt. With no husband of her own, Eleanor, the daughter, now a spinster, toiled on. It's hard to tell, but it would seem that her health was of some concern. She consulted a Doctor, John Kimball, in August of 1822, March of 1823 and Sept of 1824 for advice and medicine. We know that she was very sick in August of 1824 and she lived with the Durgin's for at least two weeks while Dorcas nursed her back to health. Eleanor also saw a Doctor Samuel Fish in Sep 1823 and August of 1824. In March of 1825 Eleanor, her health seemingly recovered, began working for a man named John V. Barron of Peeling. I'm not sure what her job description was but it was most likely in a domestic setting. She was to earn 50 cents per week. In June Barron sold her seven yards of calico, silk thread and some tobacco, she must have intended to make a new dress. On the 28th of July she was too sick to work. Her employer, John Barron, hired a man and sent his horse and chaise to Campton to fetch a nurse to care for Eleanor. 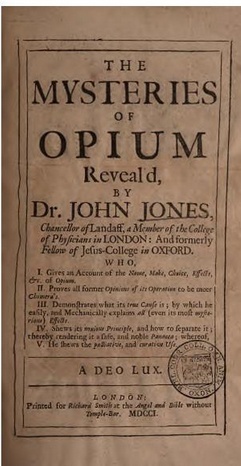 He also sent to Plymouth for a doctor. Dr. Robbins and Dr. Simpson, both from Plymouth, 18 miles away, arrived to treat her. On August 1st supplies were purchased to help treat the sick Eleanor. John Barron bought eight, yes eight, gallons of New England Rum, Madeira Wine, tea and loaf sugar. John Durgin also bought three lemons, candles and more sugar. The local "Pharmacist" provided medicine ordered by the doctors. 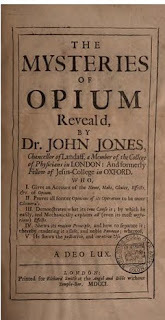 These medications, in the form of tinctures and elixirs included: Sugar of Lead (lead acetate), Calomel (a cathartic used to treat fevers), Diaphoretic Powder (an opium preparation) Tincturia Opii Camphorata (more opium), Valeriana (made from Valerian, it was used as an antispasmodic and to help sleep) and Hydragyri ( a form of Mercury, and we know how good that is for you). There were several other tinctures which I could not decipher, but I'm sure they were probably just as useless, if not downright detrimental, as these. As Eleanor's illness progressed more nurses and attendants were called in. Dorcas Durgin and her daughter as well as Catherine Thornton came to help nurse her. John Barron's wife, Oliver Barron's wife, and a local woman named Jenny Sabetee all sat with her. Several men were also in attendance including John Durgin, Jenny Sabatee's husband and a man named Timothy Glover. Dr. Robbins visited Eleanor again on the 13th of August. John Barron bought an additional 2 gallons of rum and more tobacco the same day. I'm not sure if the rum was for the patient or the nurses. Despite their best efforts, Eleanor died on the 15th of August. Timothy Glover dug her grave and John Barron paid for her coffin. Almost immediately the process of probating her meager estate began. Eleanor's cousin, William Thornton, who was also the guardian of her mother and step father, recommended John Dugin to act as administrator of her estate. Notices were posted to call in all her debts including all costs accrued during her "last sickness", as it was called. The doctor's bills, medicine bills, all that rum had to be paid. The nurses, including her sisters, wanted to be paid. John Barron wanted to be paid for housing her family and for doing her laundry. Eleanor also had outstanding debts for cloth and other sundries. It seems, no act of human kindness came without a price tag. An inventory of her estate was done. She had very little. Some furniture, a chest of drawers, a pair of gold ear bobs, an earthenware bowl. I guess she never got to make that last dress as the cloth was inventoried. The majority of her estate was her personal clothing. John Durgin brought all of her belongings from the Barron's house in Peeling back to Campton. Dorcas washed all of her clothing and prepared it for sale, she, of course, asked to be paid for it. 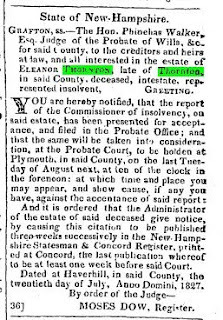 The sale was advertised in the New Hampshire Statesman and the Concord Register as was the call for all claims against her estate. The inventory showed that she had about $163.00 worth of personal property. By June of 1827 her estate was settled. She had barely enough to pay her debts. I don't know where she was buried. The town of Peeling is now a ghost town. If she is buried there, she has very little company. Hopefully her sister brought her back to Campton, but as there was no bill for it, it may not have happened. John Savary, A Compendium of Domestic Medicine, (Churchill and Sons, London, England : 1865). "Multiple Classified Advertisements. "[Concord, New Hampshire] 17 Feb. 1827: n.p.19th Century U.S. Newspapers, Web. 7 Sept. 2015.